What's wrong with Australia's democracy? Kevin Bain reviews three publications offering diverse perspectives of what is ailing Australia and what should be done. THESE THREE BOOKS give a platform for a diverse bunch of Australian commentators, activists, politicians, system operatives and academics. Some drill down on functional aspects, others reflect on populism, fear of what might be coming, visions of something better and change strategies. Naturally, diagnosis and remedy go together but the terrain is tricky: the Chifley’s “Light on the Hill” is more ambiguous today and the old saw that “change is difficult” is challenged by impressive mobilisations via social media. Hopefully, readers will look at these books and find a forum to make their contribution. lovely... but despite the impending royal wedding, we still need australia to be a republic. Based on the most recent full-year reporting season, in the year to June profits hit a record $335.4 billion, up 10.1 per cent on a year earlier. Wages and salaries, on the other hand, according to the Bureau of Statistics, rose by just 2.1 per cent. So where is the money going, if not to employees? Evan Lucas, chief market strategist at InvestSMART, a company that offers investment advice, has been monitoring the reports as they've been trickling in over the past month or so. "As high as 75 per cent of profits go back to shareholders," he says. Investors have had a dream run this reporting season. Take the number of shareholder dividends (equivalent to rent for property investors) handed out, for example. Of those companies reporting a dividend, 70 per cent lifted the dividend. Overall dividends lifted by 13.6 per cent. APART FROM throwing light on Gina Rinehart’s staggering largesse to newthink tank IPA, the matter of Rinehart v Rinehart  NSWSC 1102, currently before the NSW Supreme Court, offered other tantalising pieces of information. In her case against Gina, Rinehart scion Bianca lodged three information-seeking subpoenas against three parties – the IPA, Barnaby Joyce and an entity no-one had ever previously heard of, The CEF Trust. Independent Australia was at the Supreme Court over the last two weeks and can report that, sadly, Her Honour, Ward CJ, denied all three subpoena requests. Accordingly, we get no further glimpses inside the IPA books and nor will we see what possible baggage Gina’s $40,000 cheque to Barnaby might have been carrying. But, as a small compensation, the third subpoena ­– sadly also denied by Her Honour - was for information about a very low-key entity called the CEF Trust. Bianca wanted to know why, in the period 2015 to 2017, Gina donated $4 million to this unknown operation. IA would also very much like to know the answer to this question. Especially given the several unusual features of this organisation. By way of background, CEF is a company incorporated in Victoria in 2014, whose principal place of business is in Adelaide and whose sole shareholder and director is a solicitor based in Adelaide (Mr Charles Bailes), the managing partner of the firm Tindall Gask Bentley Lawyers (see ASIC extract, Exhibit C p 107; email dated 20 March 2018 from Mr Bailes to Bianca, Exhibit C pp 109-111). Mr Bailes (in the email to which I have just referred) has confirmed that CEF is the trustee of the CEF Trust and that the role of CEF, as trustee, “is of course to further the purposes of the CEF Trust”. Those purposes have not been articulated to Bianca (nor to this Court). A schedule of donations and sponsorships paid or provided by HPPL for the financial years ending 30 June 2015-2017 (provided to Bianca’s solicitors by the solicitors acting for HPPL) lists donations to CEF as trustee for the CEF Trust in a total of $2.5 million for the 2015 financial year and $1.5 million in the 2017 financial year. Charles Morland Bailes – known to all as Morry – is not just managing partner of the firm Tindall Gask Bentley Lawyers, he is also president of the Law Society of Australia. So what does the CEF Trust do? According to Bianca’s lawyer, on 13 March 2018, Bianca sent Bailes an email asking that very question. The role of CEF Pty Ltd as trustee is of course to further the purposes of the CEF Trust, and it is not necessarily consistent with that role to provide that information to individual shareholders (even if they are substantial shareholders) of companies which may have provided funds to the trust as to do so may prejudice the possibility of future donations from those companies. That sentence implies two things. Firstly, that the Trust is some form of charitable organisation, which accepts donations. And secondly, that Gina was not the only donor to the CEF Trust. Searches of State, Territory and Federal registers of charities that Bianca’s solicitor, Mr Timothy Price, has caused to be conducted have not enabled him to locate any reference on those registers to the CEF Trust (though he has deposed that there is a reference to two other similar entities in Western Australia and Tasmania styled “The Trustee for the CEF Trust” – those entities, however, having different ABNs to that of CEF). There is, in all probability, a perfectly straightforward reason why Australia ‘s richest woman and IPA benefactor donated $4 million to a company whose sole director and company secretary is possibly Australia’s most powerful lawyer, whose firm specialises in family law. 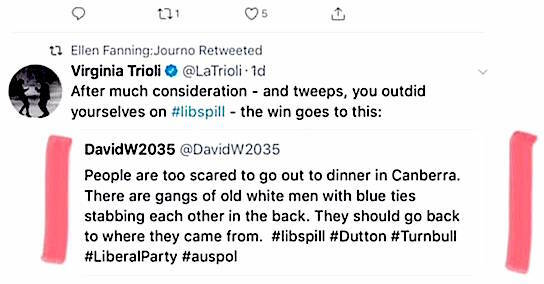 It should also be noted that Morry Bailes is a member of the South Australian Liberal Party State Executive, a donor to the Liberal Party and a Liberal Party lawyer. We are not suggesting there is anything improper about Gina’s donations to the opaque CEF Trust, nor are we suggesting the parties involved behaved in anything less than a scrupulously legal way. Just that it does seem odd that Gina Rinehart, who is being sued by for not sharing the proper proceeds of Hancock Mining with a family trust, appears to be siphoning millions of dollars of Hancock money into another Trust run by a Liberal Party lawyer and family law specialist. The matter needs to be cleared up before people begin to reach the wrong conclusions. Scott Morrison's been the Prime Minister and leader of the Liberal Party for a fortnight now. It's not long, but in the contracting life expectancy of Liberal leaders, these days, just being in place for two weeks rates as a solid performance. As is typical of incoming leaders, Mr Morrison has spent much of that time fumigating the place for any lingering traces of his predecessor. "I don't have an Akubra mate," he joked on his first full day of office, meeting national drought co-ordinator Major-General Stephen Day for a classic men-pointing-at-maps photo op. Yes... but can he do au pair? And has someone made a contribution to the Liberal (CONservative) party on his behalf? And is that someone a friend of Peter of the Pearly Gates of Aussieland? Mr Morrison tweeted the video from his Prime Ministerial Twitter account last night beneath the caption "another perspective on the drought". The video included comments from Michael MacCue, from the Wilga Feedlot at Bellata in the North West region of New South Wales. "In a way a drought's a necessary evil. It can help cut out the bottom 10 per cent that probably shouldn't be there anyway," Mr MacCue said. At the end of the short film, which focused on drought preparedness, an authorisation was provided confirming the video was made on behalf of "S. Morrison, Liberal Party, Canberra". Shadow agriculture minister Joel Fitzgibbon told Parliament such a comment would not have been promoted by former Coalition prime ministers Malcolm Turnbull or Tony Abbott. "Why is it that at the same time Australians are making an extraordinary effort to help our farmers in drought, the Prime Minister is promoting material that dismisses those farmers hurting most?" Mr Fitzgibbon asked the Prime Minister. An Australian MP has raised the possibility of Prince William or Prince Harry becoming governor general of Australia, during a debate about whether Australia should become a republic. At the event held at the Lowy Institute, a thinktank based in Sydney, federal Liberal MP Julian Leeser was asked by an audience member whether he would ever support a governor general who was not an Australian citizen. Leeser, who was speaking in favour of Australia remaining a constitutional monarchy, said he thought it was “very unlikely” that a non-Australian would be appointed to the role, but said his support would depend on who that person was. “I don’t know who it would be,” he said. “If you’re saying to me, would I support Prince William or Prince Harry becoming governor general? I think we should leave that possibility open. The governor general is the queen’s representative in Australia and is appointed by the prime minister. There is nothing in the Australian constitution saying they must be an Australian citizen and until the 1930s, governors general were British. The office of Governor-General Sir Peter Cosgrove is pleading for more cash after its eighth year of failing to make ends meet, warning the integrity of official honours could be put at risk without a funding injection. Citing a surge in demands on the Governor-General, including a spike in the number of people applying for official Australian honours, his staff are in talks with the office of Prime Minister Scott Morrison and Finance Minister Mathias Cormann for a funding boost. In the last financial year, the Governor-General's office was over its $15 million budget by $332,000, prompting the department to note it was facing "ongoing budget viability issues". The last time the office met its budget was in 2009-10 when the Governor-General was Quentin Bryce.